"These aren't just any old mashed potatoes! Lots of pizzazz!" Bring a large pot of salted water to a boil. Add potatoes, and cook until tender, about 25 minutes; drain. Melt butter in a medium saucepan over medium heat. Stir in green onions, and cook until tender, 3 to 5 minutes. 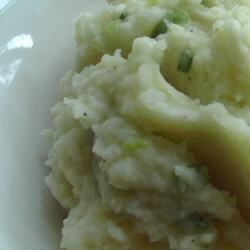 Mix green onions, horseradish, garlic powder, Parmesan cheese, milk, pepper and salt with potatoes. Mash together with a potato masher. It tasted okey, but for the work I felt it was eisier just to add a packet of ranch seasonings and tastier as well. Kimber, your potatoes were sensational! I love parm cheese so I added more and cut back on the butter a bit. LOVED this recipe and thanks so much!! These were great potatoes to serve with the roast beef recipe from this site. I only used 1/2 tablespoon of horseradish and I thought it was plenty. Very tasty!